Turn wine bottles into pillar candles. When the wine is done, turn the empty bottle into magical candlelight. This wine bottle oil lamp kit allows you to simply fill the cleaned bottle with lamp oil, insert the wick, then top off with the glass flame. Truly a glowing tribute to the enjoyment of wine. Turn wine bottles into pillar candles. When the wine is done, turn the empty bottle into magical candlelight. This wine bottle oil lamp kit allows you to simply fill the cleaned bottle with lamp oil, insert the wick, then top off with the glass flame. Truly a glowing tribute to the enjoyment of wine. Wicks each burn approximately 50 hours. Tips: Make sure there are no kinks in the wick and that the wine lights easily move up and down on the wick. Place the wine light inside the bottle so there is room around the wick to allow for air flow. Lastly, make sure the wick is less then 1/2" on top. This is to ensure the wick is burning the oil correctly. Can I buy just one glass flame protector? I broke the one that I have, but I do not need the whole kit. If so, how much it just one? No, those products are not sold separately. When I lit the wick for the first time it was very smoky and high? BEST ANSWER: A little bit of smoke firs time is normal. There should be a very short amount of wick pulled through the stopper. The more the wick the higher the flame. I have about 1/16” wick exposed. I suspect you may have had the wick too long. Try a shorter wick if it remains problematic. Good luck. Phil. My daughter received this for Christmas. She said the wick keeps getting extinguished! Any ideas why? BEST ANSWER: It might be that the wick is not thoroughly saturated with the oil. We fill the bottle to about 3/4 full and leave the wick in for 24 hours before lighting it for the first time. Also, the amount of exposed wick may be a factor. We find that it need not be too much (and less than shown in the picture works well for us), but too little may cause the flame to go out. Maybe exposing more wick will solve the problem. Good luck. I fill my bottles 3/4 full of water, then add lamp oil. Don't need as much oil - it floats on the water!! What is the size of the wick? Length, Roundness? BEST ANSWER: Thank you for your inquiry. The length of the wick is 12". Regarding the thickness, I would imagine it would a be an industry standard. If you have any further questions, please feel free to reach out to us directly at 800 356 8466. Thank you again. The wick length is 12 inches. BEST ANSWER: Thank you for your inquiry. Unfortunately the Wine Bottle Oil Lamp Kit will not fit a Champagne Bottle. If you have any further questions, feel free to reach out to us at 800 356 8466. Thank you again. The Wine Enthusiast Wine Bottle Oil Lamp kit will fit a bottle opening from five-eighths to three fourths of an inch. May be a silly question, but does this come with the lamp oil or does that need to be purchased separately? It is not listed in the description. 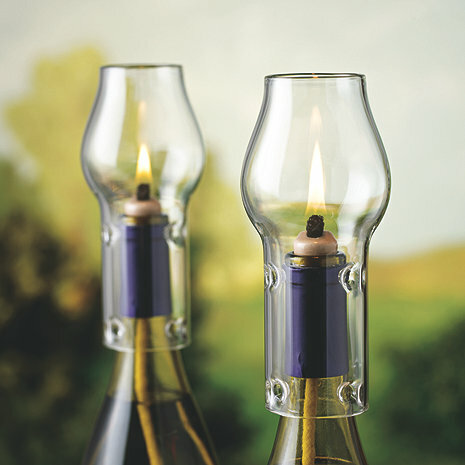 BEST ANSWER: The Wine Bottle Oil Lamp Kit includes 2 wine lights and 2 flame protectors. Lamp oil must be purchased separately. Hi! Can I purchase replacement wicks at some time in the future for my wine bottle lamp kits? If so, can you supply me with a product number and price? Just planning ahead. Thanks! BEST ANSWER: Thank you for our inquiry. Unfortunately we do not offer the wicks as a separate item. If you have any further questions, feel free to reach out to us directly at 800 356 8466. Thank you again. Wine Enthusiast does not sell the wicks separately. Does the wick come with the kit? How about the oil? BEST ANSWER: Thank you for your question. This kit comes with the wick but you will need to purchase the lamp oil separately. Please call us with further questions at 1-800-356-8466. The Wine Bottle Oil Lamp Kit does include the wick, but it does not include the oil. will this work in a champagne bottle? BEST ANSWER: Thank you for your question, the Wine Bottle Lamp kit will work with champagne bottles. It would be advisable to find a lamp kit that specifically fits a champagne bottle. Will this product work with screw-top wine bottles? BEST ANSWER: Yes, this fits most wine bottles including screw-tops.The very top of the wick cork measures approximately 3/4 ". BEST ANSWER: Typically if the wicks are burning low you want to pull them out of the bottle a bit more. You can take a look at our video demonstration right on the product page which illustrates the full candle effect. Thanks! Will these wick/corks work on other bottles as well, such as a Bailey's Irish Cream bottle? Thanks! BEST ANSWER: As long as the opening is not more than 3/4" wide - you could use on any style bottle. We also have wine cork candles(item # 256 17) which would also work nicely. BEST ANSWER: They can be used indoors as long as the oil used is safe for indoor use. Where can I get more wicks for this product? This is my 2nd order. I have looked everywhere for replacement wicks since I used the first two rather rapidly. My only option was to buy new lamps -- a rather expensive choice! I will buy more of these! I filled a wine bottle half full of colored glass stones then with lamp oil. They turned out beautiful. Only improvement would be for the votives themselves to be available in different colors. The bottles were a big hit at my party and I let guests take them home. I did not expect it to work - but it really does. A couple of suggestions from past reviews helped: partially fill the wine bottle with colorful pebbles or water [oil quickly goes to the top]. I bought these last year for myself to show off my favorite wine bottles. I decided to use Citranella to also kill mosquitoes. They are very pretty and I decided to order these for Christmas presents! I would buy again, fun use of bottles. When I use these everyone comments on them. Always a conversation starter. Use with a favorite wine bottle and it just adds a little something extra. Fun! Great idea and wonderful for outside on the patio in the summer! Wonderful. Keep a set and always have a set to give away. Everyone loves them! With wine bottle, makes attractive light for deck. I have personalized wine bottles with my animals pictures on the label so this is a great way to keep enjoying the bottle long after the wine is gone! This adds a very appropriate center piece to a table when enjoying some wine and cheese after a long day at work or enjoying that time with a few friends. It was a gift and they loved it! My wine loving friend really liked this as a birthday gift. We use them outside on our sideboard and they compliment our wine theme. We love these for outdoor and indoor dinner parties. We have several for ourselves. This last purchase are for Christmas gifts to friends who like them as well. Great conversation piece...adds ambience and can be enhanced with your imagination to provide a lovely setting. It was great to be able to utilize an item otherwise unusable, but a collectible. I added glass "rocks" to the bottom of "Jarhead Red" (USMC) wine bottles, added the light sets and made a fun gift for my favorite Marine. We chose our favorite wine bottle and made it into a cnadle and use it on our screened in porch while enjoying a glass of wine on a warm evening. My husband and I love to light the wine decanters at dinner to relax and create a romantic setting. The lamp oil light is much cheaper at department stores than in the catalogue. I use stubby Coors Banquet beer bottles for the oil lamp kit. This works just fine. I'm very happy with my kit and will order more of these for gifts to others. I'm also happy with the highest quality lamp oil that I ordered from wine enthusiast. We use this at meal times. What an ingenious way to create a romantic setting in a very practical way. You can create different candle bases by choosing different empty bottles thus creating your very own unique candle. The product arrived quickly, at the proper address and packed appropriately. A great way of using an empty bottle of your favorite wine !! Especially on a summer night, out on the patio having a pleasant evening dinner with family and friends. I put them on my most colorful wine bottles. I set them on my bar. I live in Baja, so my electricity goes out in the winter quite often, so now the candles are close at hand. Use for inside around the bar area or for the dining room table. For outside use with citrinella oil. The first lamp that I have used that does not smoke. Put some small pebbles in your favorite wine bottle and fill it up with lamp oil. Very nice to use outside and in!!!!!!!!! Can be used indoors or outdoors. Instead of throwing out your used bottles, you can display them in candlelight. Don, "Your got to Guy"
This is a great way to display and reuse a cherished bottle of wine. Instead of peeling off a label and placing it inside a book as a keepsake, you can display the label on its original bottle in a functional way that provides romantic lighting. Like most oil lamps, the light produced by this is less than that of a candle, but it still provides nice romantic lighting. The box states that this "fits most wine bottles" which I have found to be true, but it won't fit bottles that have a large opening, such as many flanged or champagne type tops. This flame protector is made by Vintage Concepts. Vintage Concepts also makes flame protectors that fit "most champagne bottles" and "new flanged wine bottles"; I would recommend that Wine Enthusiast carry those, as well, as this is a wonderful item. Until carrying those additional options, I would recommend listing on the web-site what size/type bottles they may or may not fit, so as persons are not dissapointed. I think this would make a great gift. If you've saved a bottle from a previous romantic evening, this is a wonderful way to rekindle those memories. It's a great way to replace candles if you use these with a quality oil, they smoke way less than candles! Instead of saving that special bottle while it collects dust or even discarding, why not showcase it while iluminating. This makes a great gift for those who collect fine vintages and/or unique bottles. The best part is that it really works as a lamp. Perfect for al seasons and occasions. Worked very well in a camping situation. We used the wine bottle light set to light the table while we ate camp food in the dark. We were able to see what we were eating. I'm glad I ordered two sets, as the first did not fit over the particular wine bottle I wanted to use, however the second fit easily. There is a pretty wide variance between the two I bought. Overall, very happy with them. It is a great way to save that special bottle. Sometime we purchase a bottle just for the label knowing we are going to make a wine light. They make wonderful gifts. One fill burns a very long time. It's pretty and practical, but fragile. Only problem was that it did not fit the bottle that I wanted it for. It did fit another bottle and works great. I should have bought two sets! When i first ordered it online it was on back order and i didn't think i would receive it by Christmas. The kept me informed through emails and it arrived just in time! Perfect! Great product. The only concern is its use in slender bottles that might be more prone to tipping. Great mood lighting for the dinner table. Attractive design and the ability to vary the brightness vs a candle. An excellent way to preserve a memory from a treasured bottle.